Many times, you’ll want to see what your most popular pages are on your website. This information is useful to know if the content is popular or if users are viewing certain pages that you consider valuable. Enter the All Pages report. 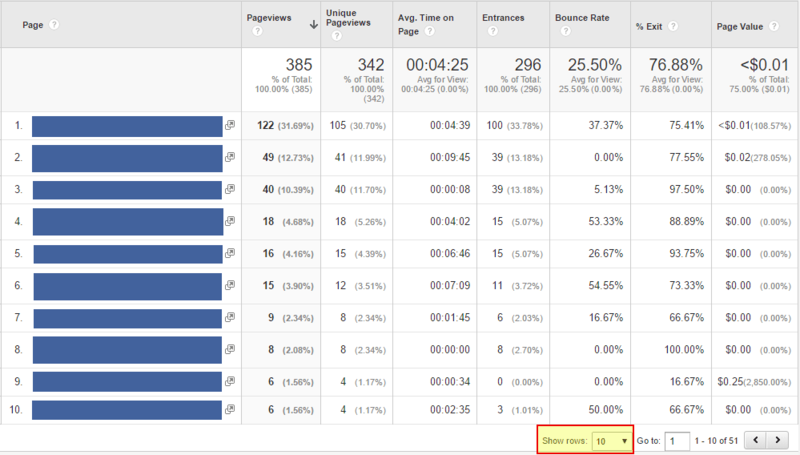 To find your top pages, open Google Analytics and navigate to Behavior -> Site Content -> All Pages. In this page report, you can quickly get a feel for what your top pages are, as well as usage information such as Unique Pageviews, Avg. Time On Page, Entrances, Bounce Rate, % Exit, and your Page Value. Unique Pageviews This metric only counts one per pageview of a given page per session. So even if a user views a page several times within one session, this only counts as one unique pageview. Avg. Time On Page The average time users spend viewing the page. Bounce Rate The percent of times this page was the only page a user saw – meaning they entered this page and viewed no other page. Page Value Can be unlocked if a dollar amount is used in goals – shows the calculated value of the page as it relates to money. It’s very common to see some common pages in this report – usually the website’s homepage and contact are common for many organizations. Beyond that it can vary from organization to organization. Ideally, you’ll see the pages that mean the most to your organization – perhaps it’s a product detail page, or a services list. If you have a complex site, it’s likely that you’ll want to see more than the default top 10 pages. To view more than 10 pages, select the dropdown in the lower right corner and change the value to one of the other options – 25, 50, or 100 pages. Usually, viewing anything beyond 25 pages will likely have fairly low pageviews in comparison to the top 10 pages, but this may vary for the size of your site and amount of inbound traffic. So now that we have a sense of our overall top pages, let’s see how some of our products or services are doing. Ideally, your site would be constructed in a way that all services or products are listed in a single directory, such as “/services/” or “/products/“. To search by directory, let’s add the URL slug in the Search field, and Google will filter out any results that don’t contain that URL slug. Now we can see what our top services and products are. If you click the Advanced link, you can add multiple filters and choose if you want to include only those matching the filters, or exclude any that do not match. Remember, you can also expand your timeframe to see seasonal trends in page content. This can be very helpful for looking at trends over time, as well as if pages fall in and out of favor over the years. After Popular Pages, What’s Next? I’d recommend checking out the following articles to learn more about Google Analytics and see what’s popular on your site. Good info about Google Analytics page view.